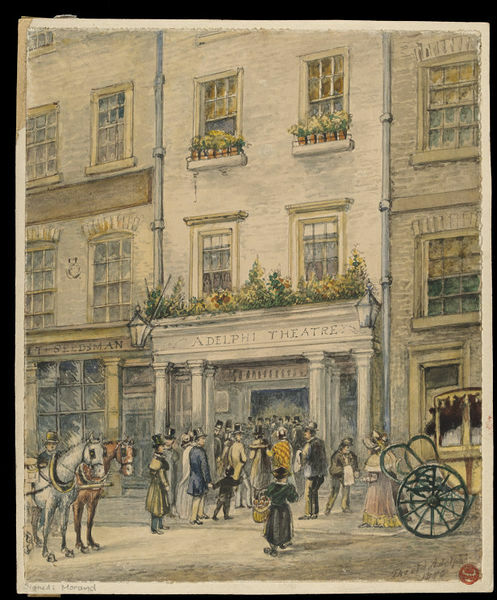 This watercolour painting shows the exterior of the Adelphi Theatre in 1818. A group of audience members are entering the theatre and their coaches and horses are waiting outside. Amongst the crowds are a number of women dressed in bonnets and shawls, accompanied by gentlemen dressed in top hats and pantaloons. There is also a small flower seller carrying a wicker basket. 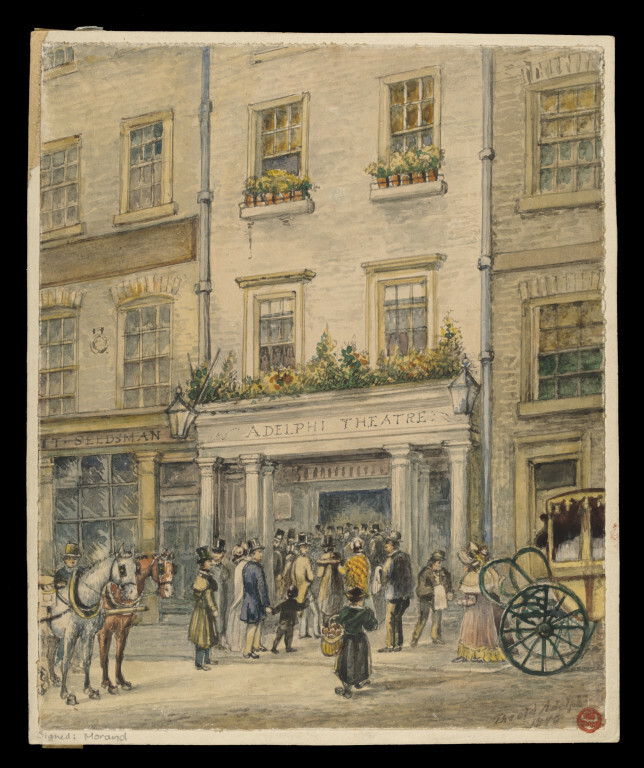 The Adelphi Theatre was founded in 1806 as the Sans Pareil ("Without Compare"), by merchant John Scott, and his daughter Jane (1770–1839) who was a British theatre manager, performer, and playwright. Together, they gathered a theatrical company and by 1809 the theatre was licensed for musical entertainments, pantomime, and burletta. In 1819 Jane Scott retired to Surrey, marrying John Davies Middleton (1790–1867) and in October of that year the theatre reopened under its present name, which was adopted from the Adelphi Buildings opposite. A watercolour painting of the exterior of the Adelphi Theatre showing audience members entering the theatre and coaches and horses waiting outside. Amongst the crowds are a number of women dressed in bonnets and shawls, a small flower seller carrying a wicker basket and gentlemen dressed in top hats and pantaloons. 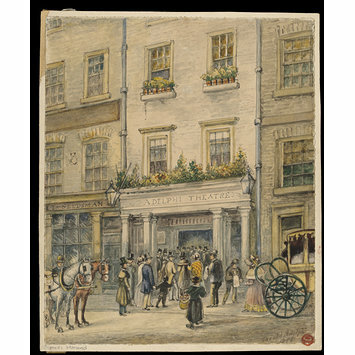 Watercolour painting of the exterior of the Adelphi Theatre, signed Morand and dated 1818.